An unfortunate truth of this world is that many people don't get to live lives as privileged as others. Then again, even those who do lead a "privileged" life can have unfortunate things befall them as well. I'm sure many of you have been touched by some form of tragedy at one point or another - even in our moderately sized wargaming community it seems like someone's life is negatively changed every month or two. In those times, we tend to give them the space they need and there's always plenty of warm wishes passed on. There are plenty of organizations out there that are more active in life changing circumstances, doing whatever they can to ease the pain of those directly affected as well as friends and family. There's plenty you can give besides money, which not everyone has.. supplies and especially TIME can often make a big difference - if you're not sure what you can offer, then ASK. I've been involved with a number of local charities, donating money, yes, but also time - and if there's one thing that will show you the difference a charity can make, it's spending a moment of your life with both givers and receivers. To quickly put monetary donations in perspective: First off, anything helps, a dollar, five, whatever. However, hold off buying that extra unit for a bit, don't grab that fast food 2-4 times, skip going to the movies once and rent something with friends instead - these all add up to good amounts of money to donate that takes very little effort on our part to afford. I like to see that our digital community also does what it can to make the world just a little bit better. That's one of the things that defines us as a community, rather than just a bunch of blogs linking to each other. The following are some of the charities going on right now - but remember, nothing stops you from donating to your local food bank / good will / clothes, holiday toy drive or even selling your old minis on eBay and donating the proceeds. Nikephoros did bring up a good point, which is to make sure the charity you choose to donate to is legitimate and preferably one with a high efficiency that's not wasting money on lavish campaigns, salaries, gold toilet seats, etc. (He recommends this site for help checking up on charities) Also, if you're uncomfortable getting involved in online fund-raising like the following sites, then go to the charities they support (or others you agree with) and donate something. FYI, anyone running a charity project need only contact me and you can be I'll plug it. At any time, you can also click my "Charity" label to see what recent charity projects have been announced. I'm linking it first, because this contest is over FRIDAY. That means you've got a day left to donate. Basically, donate blood or money your local bank, send them proof, and you're entered to win a Forge World Greater Demon of Khorne. Last year, these guys raised over $16,000 for Doctors Without Borders in the Storm Wardens project. This year, they're aiming bigger. Four 3000pt armies will be built and auctioned off. This happens with the support of time and effort from some incredible painters and people/businesses who generously donate their resources to help the project. Massive Voodoo, a large site with a huge readership is promoting eBay sales of artists who pledge to donate the proceeds of their minis to japan relief. They're concerned that they're up against other fund-raising efforts, but y'know, if money's an issue, then hold off buying that extra unit of guys or junk/fast food and donate to another charity for another chance at winning a giant army. 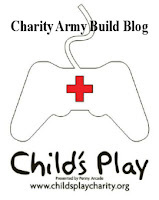 This is an initiative from Miniature Wargame Conversions to build minis and sell them through a page eBay offers to streamline the process of buying items and having some of the proceeds go to charities. They'll be donating to the Lance Armstrong Foundation "Live Strong". Additionally, these guys have offered face time on their site for other charity projects. You can also get involved in eBay Giving Works right away by selling items through them instead of normal methods, and opting to have a portion of your auction go to a charity of your choice.